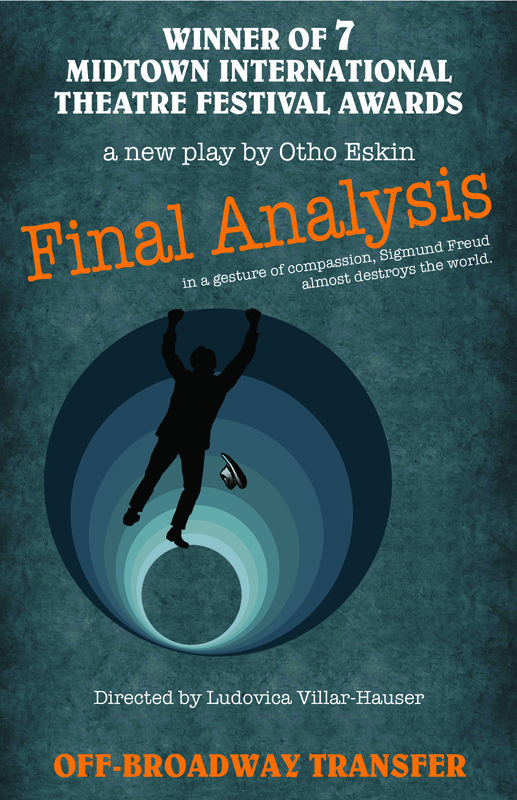 Help transfer FINAL ANALYSIS, Otho Eskin's acclaimed new play, to Off-Broadway! The success of our developmental production of Final Analysis by Otho Eskin at the intimate June Havoc theatre has inspired us to seek a larger venue and an extended run. We have secured the Alice Griffin Jewel Box Theatre in the new Frank Gehry interior designed Pershing Square Signature Centre on West 42nd Street. Moving Final Analysis to this venue will allow us to reach a larger audience and explore the question, "has man already fallen into the abyss?" At this theatre we are fortunate to be playing in repertory with Two Planks Productions' BREAKFAST WITH MUGABE by Fraser Grace for 10 weeks from August 6th - October 6th. By playing in rep we halve our theatre rental and many other costs making this move possible and financially sound. For our Kickstarter Campaign we are focusing on the START UP and are looking to raise $50,000. This will cover accounting & general management services, bonds, design fees, insurance, marketing/PR and rent. We are thrilled with the many benefits we are able to offer our backers. You should know that VHTD Fund, Inc. is a 501 (c)3 tax-exempt corporation, whose mission is to present affordable, intelligent plays and provide work opportunities for women in what is often seen as the male dominated world of theatre. Your contributions will be tax-deductible to the full extent allowed by law. The Villar-Hauser Theatre Development Fund produced the world premiere of FINAL ANALYSIS, by Otho Eskin in this year's Midtown International Theater Festival. The production was enjoyed by both critics and audiences. The success of our developmental production of FINAL ANALYSIS at the intimate June Havoc theatre has inspired us to seek a larger venue and an extended run. The Villar-Hauser Theatre Development Fund, Inc. is a not-for-profit 501 C3 tax exempt Corporation and all donations are tax deductible to the full extent allowed by law. We have come up with fun incentives for donating. Please see below! Thank you and see you at the theatre! OPENING NIGHT PREMIUM: Two PREMIUM section tickets to the OPENING performance of Final Analysis on Sunday, August 18th at 2:00pm and AFTER-PARTY and two invitations to the PRIVATE PARTY. OPENING NIGHT: Two tickets for the OPENING performance of Final Analysis on Sunday, August 18th at 2:00pm and AFTER-PARTY and two invitations to the PRIVATE PARTY. DREAM BACKER: Two tickets to FREUD NIGHT, a performance of Final Analysis followed by a reception featuring the food, drink and music of 1910 Vienna and a Freudian expert speaker and dream analyst and an invitation to the PRIVATE PARTY. BEHIND THE SCENES: Be present for a rehearsal. Watch director Ludovica Villar-Hauser work with the incredible cast and creative team of Final Analysis. Have a chance to meet Playwright Otho Eskin. See first hand the work that goes into creating theatre. Get autographs before or after rehearsal! Also enjoy an invitation to the PRIVATE PARTY. VIP: Two VIP-section tickets for your choice of performance to Final Analysis and two refreshments before or after the performance at the Signature Cafe and an invitation to the PRIVATE PARTY (Subject to availability, excluding opening night and special benefit performances). PRIVATE PARTY: Invitation to a FINAL ANALYSIS event hosted in the private home of one of our most ardent supporters! PREVIEW BACKER: Two PREVIEW tickets on Thursday, August 8th at 7:30pm, Saturday, August 10th at 2:00pm, OR Saturday, August 10th at 7:30pm (running time 90 minutes). DRESS REHEARSAL: A ticket to the Final Analysis Dress rehearsal (running time 90 minutes). MUSIC FAN: Download two Lieder by Alma Mahler, recorded exclusively for Final Analysis by concert pianist Melody Fader and opera singer Lauren Criddle. ALL DONORS WILL BE LISTED IN OUR PROGRAM AND SPONSORS PAGE ON THIS WEBSITE. DONORS ABOVE $5 WILL BE THANKED ON FACEBOOK, TWITTER, AND THIS WEBSITE!